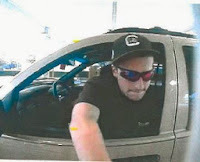 Police need help identifying stolen check suspect | Crime Stoppers of the Lowcountry: 554-1111 | 1-888-CRIME-SC | Anonymous tips earn cash rewards with Crime Stoppers of the Lowcountry. NORTH AUGUSTA, SC - North Augusta Public Safety is attempting to identify a man who allegedly used stolen checks late last year. Investigators released a surveillance photo of the suspect and is asking for the public’s help in identifying him. According to police, the suspect was last seen driving a Jeep Cherokee SUV that was either tan or silver. Anyone with information about this crime or the location of the suspects is asked to call CrimeStoppers of the Midlands at 888-CRIME-SC. Callers will remain anonymous and may be eligible for a reward of up to $1,000.